According to Harvard Business Reports, the on-demand economy attracts 22.4 million consumers annually, who spend $57.6 billion on them. These on demand services, in addition to food delivery and taxi booking, include healthcare, grocery and other hyperlocal services, home care services, etc. 49% of on-demand users are millennials, remaining 30% are in the age group 35 to 54. This growth and activity should continue this year too. Because of the biggest success of this decade: Uber and Airbnb, consumers’ expectations have changes. Now they expect instant provisioning of goods and services. Smartphones have been the game changer, and the handiness they have brought for people is extraordinary. Today, people hire plumbers, stylists, and therapists right from their smartphones. Industry experts believe that there will be vast shift to the way sharing economy works. Now, increasingly entrepreneurs are realizing the potential in diverse industries and consumers are embracing benefits that on demand economy brings. Although, there may be many on demand startups that struggling to generate profit, their revenue streams seem to be growing. While Uber and Airbnb control and in a sense, define on demand market, they are not the only two offer the service. More than a hundred such service providers exist in the market today all around the world. While technology has evolved enough to enable on-demand app development services, the key is to eliminate friction between the buyers and sellers that existed before Uberization took place. Now, most businesses are building mobile apps to enable a service previously unthought of in the digital spectrum. They may not all reach a billion-dollar valuation like Airbnb; they will expand on-demand economy. Consumers expect their demand to be fulfilled instantly and they have given up the thought of waiting. For startups that are entering an unchartered territory outside on-demand economy, this is a great opportunity. Even if you’re entering an established sector inside the economy, you can still lead the game with better personalization and quicker service and will be a real winner. The problem is a lot of businesses are struggling to find a new territory to capture. Sooner or later, better personalization is all that going to matter. The on-demand economy is here to say and it’s definitely not a bubble. You must adopt it before your competitors do. You can consult a mobile app development company or reach out to industry experts. Remember, all customers want in a product or service is flexibility, personalization, and responsiveness. Everything else can wait. You must satisfy all these desires to grow your on-demand business. When 30 years old Samuel orders grocery from his favorite app, the request gets routed to a nearby delivery person, who buys it on Samuel’s behalf from a local departmental store. He pays the cashier as Samuel would, puts it in the delivery van and delivers it at Samuel’s. For providing the service his employer charges a little commission from both the storeowner and Samuel. Hyperlocal is a subset of on-demand economy and revolves around local provisioning of goods & services against demands from users. Epic Delivery is a hyperlocal online marketplace developed by Peerbits that lets users have anything, anytime they want from a nearby merchants. A user just has to tell the delivery address and the list of items, the app will provision the rest and deliver to his place. Jobs are getting outsourced to freelancers and part timers like never before. Whether its technical or non-technical work, all sorts of work are getting outsourced by employers, who don’t want to hire a full-timer for short projects which can be completed in couple of weeks or months. This way they are saving on costs i.e. to hire a full timer in their corporate premises and providing him all facilities as an employee. Peech is community job app developed by Peerbits that connects experienced marketing freelancers with potential employers and vice-a-versa. Freelancers registered on the app can declare their availability and become searchable to potential employers. Employers looking for a freelancer for long as well as short term can shortlist suitable candidates and select the one with inbuild video interview functionality. With our lives becoming busier than before, who wouldn’t like to avail any service by sitting at the comforts of one’s home? With more and more people becoming Internet savvy, people now want to do everything online, whether its payment of credit cards/bills, ordering for their home requirements or availing any paid service. So now you can order a beautician or call a plumber or electrician by just visiting some sites, which act as a middleman between the customer and the service provider. 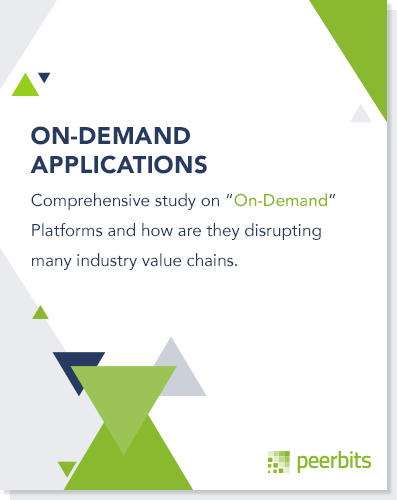 Thus On demand services are here to stay. People no more want to venture out of home and travel long distances, looking for services /groceries. Similarly they want to save on costs by not employing full timers for short projects.